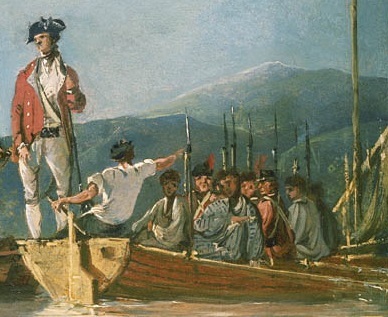 Landing at Mallicolo, One of the New Hebrides, William Hodges, mid-1770's, National Maritime Museum. William Hodges gives us another view of Captain Cook's explorations, one that is decidedly more peaceful than the last painting we examined! Four officers stand in the foreground atop the boats, while a number of marines and sailors sit and work aboard the boats. Behind Cook's barge a sailor gestures toward the natives ashore. His shirt is wide open and he wears no neckcloth. Atop his head he wears a simple workman's cap or knit cap. Beside him is another tar in a white shirt with the sleeves rolled up. His neckcloth is an orange or a red, though the exact details are a little unclear. Further astern is a jack in a typical blue jacket, and behind him is a seaman standing with the oar. His open shirt is white, matching very loose breeches or possibly trousers rolled up above his calves. 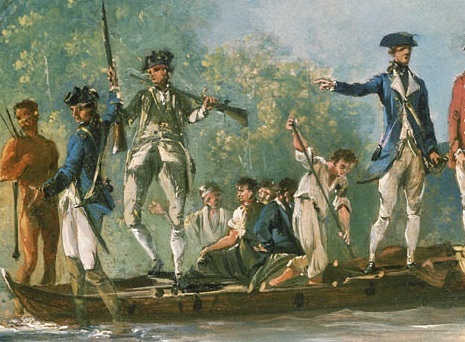 To the right of the marine officer in the red coat is a coxswain. The coxswain's shirt is also white, and he wears blue breeches and a dark cap. His oarsmen are likewise in their shirtsleeves, but without caps.